Curiosity has moved for the first time since December 13, 2018. More importantly, Curiosity is moving to a new geological unit that we have so far called the "Clay-Bearing Unit" (CBU). The MSL rover team, following previous rover teams, has organized itself into different campaigns to explore different geological units. Organizers are nominated to lead these campaigns, and their job is to help coordinate among the competing interests of the different instrument teams, helping to make synergistic, collaborative discoveries. The organizers of the CBU campaign have been patiently waiting for their turn to lead the campaign. After all, their first meeting was well over a year ago, on October 3, 2017. Curiosity has not actually arrived yet. The rover team is searching for the geological contact between bedrock of Vera Rubin Ridge and that of the CBU. The precise boundary is not clear from orbit, and it could also be a relatively gradual change as seen from rover images. To have the best chance at observing the transition, Curiosity is doing relatively short drives, interspersed with frequent observations by both remote and contact instruments, as the terrain allows. The rover drove about 38 meters over the holiday weekend, and ChemCam made a post-drive observation using AEGIS software. Before tosol's drive ChemCam will shoot a 5x1 raster on "Oldmeldrum," 10x1 rasters on "Dyce," "Banchory," and "Elrick." ChemCam will also take a 3-image mosaic of a feature of interest in the sulfate unit. Mastcam will image all of the local ChemCam targets including yestersol's AEGIS target, and will image one additional target, "Dalmellington," which is a rock with a protrusion. Navcam will take a movie looking for dust devils, and Mastcam will take an image to check the tau (atmospheric opacity) and a crater rim extinction image. After the drive the rover will image the local terrain with Navcam and Mastcam, including a 360 degree observation with Navcam and a clast survey with Mastcam. 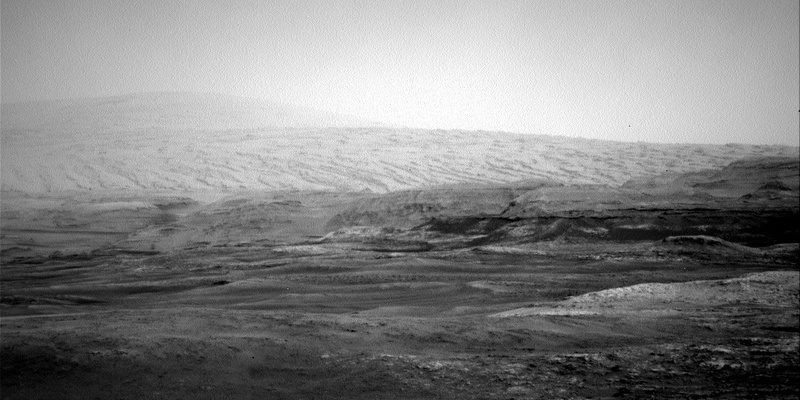 MARDI will take a post-drive image of the ground below the rover close to sunset. DAN, RAD, and REMS will also collect data, as usual.